Three more stories of bravery and derring-do from our favourite baker boys! The much-loved picture book pair of pooches continue their adventures in a two-colour fiction format, ideal for children growing in confidence as readers and beginning to read alone. In the title story, Shifty and Sam lead the way in a wacky race that has been sabotaged by the one and only Red Rocket! But they soon thwart his dastardly ways and the rightful winner takes home the prize. When a mysterious parcel is delivered to the cafe, both Shifty and Sam claim ownership. A rift grows between the boys until a small knight rides to the rescue. Rich old Mrs Snootington is staying at the posh hotel in town, just as a spate of burglaries takes place. 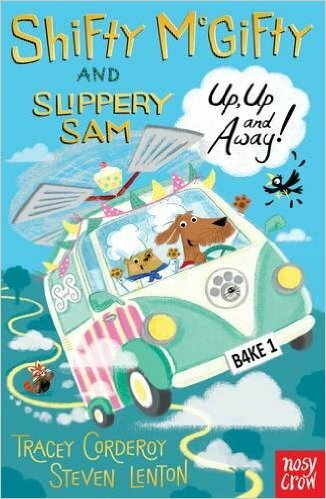 Can Shifty and Sam go undercover to catch the thief? Brilliant stories hilariously told by Tracey Corderoy and beautifully brought to life by Steven Lenton’s illustrations.